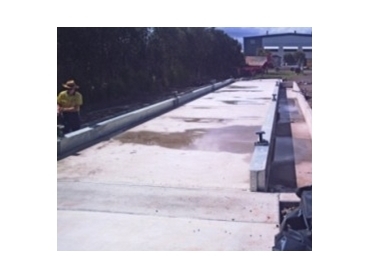 Accuweigh have recently commissioned a shallow pit weighbridge for SEQ Hauliers depot in Hemmant, Brisbane. The concrete deck shallow pit weighbridge allows easier truck access on sloping sites by keeping the length and height of weighbridge access ramps to a minimum. Shallow pit weighbridges are an economical alternative to a fully inground weighbridge. Government requirements stipulate that a minimum of 1 metre of spacing on both sides of the weighbridge length is required to provide free access to the weighbridge load cells during weighbridge cleaning and servicing. This shallow pit weighbridge was supplied by Accuweigh’s QWM branch and is a fully galvanised unit measuring 28 metres long and 3.5 metres wide and is configured for a dual range weighing capacity of 80t. Further to this, eight stainless steel AccuCell weighbridge load cells, of 30t capacity each, are used to support the heavy duty concrete weighbridge deck.